João Dumans and Affonso Uchôa, who wrote and direct “Araby,” focus on the type of person who is ignored by politicians whether in Brazil or here in the U.S. While candidates for office regularly talk about how they are for the middle class (never mind how they are really for the upper 10% or 0.1% with Bernie Sanders as an exception), none are for the poor. The poor don’t vote. The homeless certainly do not vote. So why bother? 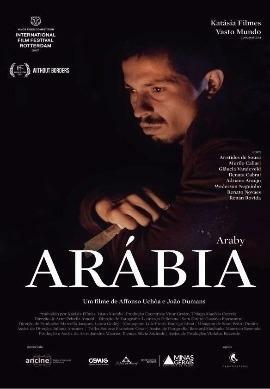 With “Araby,” though, we are launched into an episodic struggle of those in Brazil who are uneducated, only partially literate, and having little or no knowledge of how politics makes the world go ‘round—except for them. But if the world cannot go round for Cristiano (Aristides de Sousa), the principal character can himself go round albeit not worldwide or even Brazil-wide but throughout that wonderful country’s southern state of Minas Gerais. The province is treated unsympathetically, with Cristiano an allegorical figure representing the difficulty of making even a basic living for someone who is brought up in a small town and probably thinks that Rio is on the other side of the world. In a twenty-minute introduction, one which could be cut without losing the epic quality of the movie, Andre (Murilo Caliari) is a teen lad taking care of his kid brother—who believes in the Devil but not in God because look at all the “shootings and killings.” His life is full of dull routines, but when he finds a memoir written in a notebook and perhaps imagines some of what he reads, he unfolds the tale of the wandering Cristiano. Cristiano has a sense of adventure. After all, life looks dreary and mean for a man who stays in a small town and who thinks he can achieve a better living on the road and doubtless could meet people from various backgrounds, each stranger-becoming-friend adding to his memories. As he says, what do we have except what we remember? He takes on factory jobs and farm labor, in one case picking tangerines but finding after his hard work that the boss has no money to pay him. But the foreman allows Cristiano to fill up a bag with tangerines and sell them on the road, which he does, and being without money spends a day or so eating nothing but the fruit. When he runs into a person who had once become a “troublemaker,” organizing a union of 200 farm laborers, he managed to pull off a strike which left the tangerines about to rot until the owner gives in and pays a living wage. Cristiano becomes political. The film is filled with songs particularly absorbing because they are in the lyrical Portuguese language, albeit Brazilian style. The most involving one is Townes Van Zandt’s “I’ll Be Here in the Morning” (available free on youtube, go check it at https://www.youtube.com/watch?v=AjGOxo0KDMs. While some of us will leave the theater wondering whether Cristiano would have been better off staying put, given the crashing of his view that anything can happen, others will conclude that poverty aside, at least he has gained more insight into life than he could not have had without his travels, the trips having the auto-didactic quality of making him realize more about himself and about his world. This film is for those who do not need flash or pomp but for theatergoers who are patient, appreciative an in-depth view of a single person who is impacted by what he sees and hears. The title comes from a joke about an Arab–by a worker to his lunch pals. In Portuguese, English subtitles.